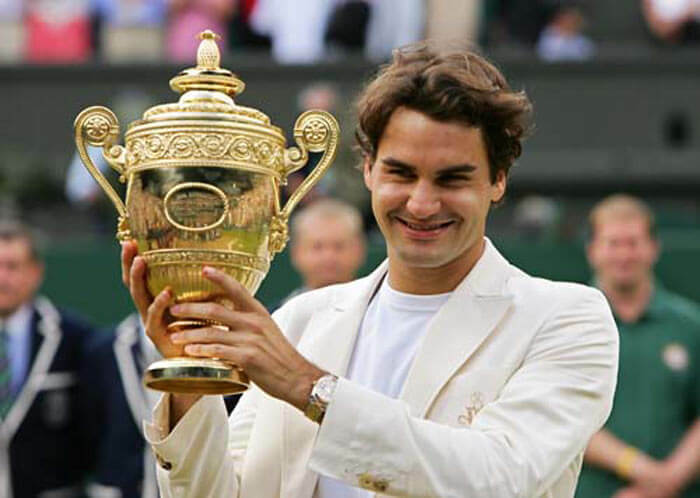 Let’s have a look at Roger Federer road to clinch his 4th consecutive Wimbledon title in 2006 and the records he set after winning his 8th Grand slam final. Roger Federer defeated Rafael Nadal 6–0, 7–6(7–5), 6–7(2–7), 6–3 in the final to win his fourth successive Wimbledon title, at the 2006 Wimbledon Championships. This was a tournament where he did not drop a single set up until the finals.It would be the first of three years in succession that Federer and Nadal would meet in the final of Wimbledon. Andre Agassi made his final Wimbledon appearance, losing to Nadal in the third round. 1R Richard Gasquet6–3, 6–2, 6–2: The opening match was an easy win for Federer against Gasquet in straight sets to set up a clash with the home favourite Tim Henman. 2R Tim Henman 6–4, 6–0, 6–2: A British veteran and home favourite squaring off against the defending champion, this was a highly anticipated match. Federer ended up on the winning side against Tim Henman though, with a sublime display of tennis. Henman dropped serve in game three and never got back in the match as Federer powered to a 6-4 6-0 6-2 win. 3R Nicolas Mahut 6–3, 7–6(2), 6–4: Federer took the first set quite easily. But he had to go the distance with the 2nd set, though he cruised in the tie break to clinch it and move to an easier 3rd set, ultimately winning and setting up a 4th round clash against TomášBerdych. 4R Thomas Berdych 6–3, 6–3, 6–4: This was a master class from Federer and a youngBerdych had no answer to his play. Federer won in straight sets, firing 21 aces with 845 1st serves won. QF Mario Ančić6–4, 6–4, 6–4: Federer exacted his revenge on Ančić, who was the last man to defeat himon grass, with a straight sets win. The three-time Wimbledon champion Federer wasted no time in beating No. 7-seeded Mario Ancic 6-4, 6-4, 6-4 on Wednesday to reach the semifinals. Semi Finals Jonas Björkman6–2, 6–0, 6–2: Federer just needed one hour and 17 minutes to brush past the Swede Jonas Björkman, even bageling him in the 2nd set. Björkman was 10 years senior and he had no answer for Federer’s booming serves and his aggressive play. Doubles specialist Bjorkman described Federer’s performance as almost flawless. “I felt like I played a guy who was near as perfection as you can play the game,” said the Swede. “He just made it look so easy. 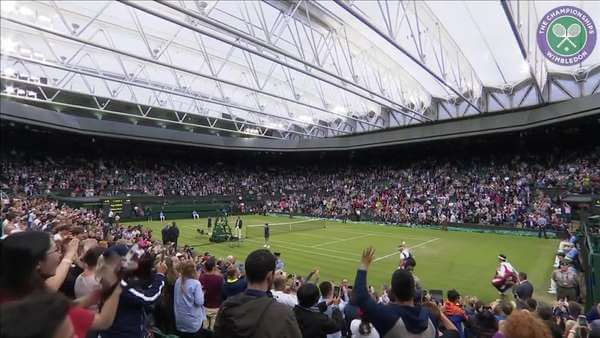 The result extended Federer’s Open era record grass-court winning streak to 47 in the most one-sided men’s semi-final at Wimbledon since the tournament adopted its current format in 1922. Finals Rafael Nadal 6–0, 7–6(5), 6–7(2), 6–3 :Federer zoomed past Nadal in the first set with a bagel, breaking him early. After being 0-5 down, Nadal hit 3 serves to Fed’s forehand in a row, winning 2 of the 3 points. He then got broken by losing the last 2 points after serving to Fed’s backhand.For the second set, Nadal ended up serving 17/17 serves to Fed’s backhand in the deuce court and 12/17 to Fed’s forehand in the ad court. He won 80% of his serves to Fed’s forehand to the ad court. In the third and fourth sets he went back to the backhand primarily, serving 85% to the backhand in the deuce court and 68% to the backhand in the ad court. Federer broke Bjorn Borg’s record of 41 successive grass-court wins by defeating Gasquet in the first round and was looking forward for his eighth grand slam title. He had by then won four Wimbledon titles in a row, which is a great achievement and he got into the elite group with Sampras and Bjorg, the only two players in the modern era to have done that.He also came at par with Ken Rosewall, Fred Perry, Jimmy Connors, Andre Agassi and Ivan Llendl with his 8th major win. I hope any year I come back here in the final and win, I hope one year I don’t play against a guy like Roger,” said Nadal. “He played unbelievable on this surface and I improved a lot this year, so I am very happy for that.But I can play on this surface, no?” Nobody doubts it now, especially Federer.